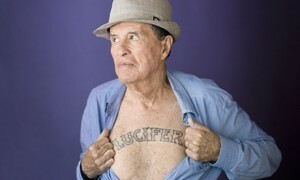 Kenneth Anger Hosts New Exhibit Featuring Work From Cameron and Rosaleen Norton – Zero Equals Two! The London Guardian has posted a story about a new gallery project Lucifer Brothers Workshop which opened at the Art Los Angeles Contemporary fair this passed weekend Santa Monica, CA. The focus of the exhibit is the work of two women who are fairly well known within the occult community but still underappreciated by the general public, Rosaleen Miriam “Roie” Norton, an Australian pantheist known as “The Witch of Kings Cross” and Marjorie Cameron. There’s be several exhibits featuring the latter’s work including a show at MOCA in late 2014 and one in NYC in 2015. Cameron, of course, was one of the main players in the Anger film Inauguration of the Pleasure Dome.